I’ve been stitching on a very small piece of fabric something about Vermont where I grew up. Rivers, brooks and ponds are plentiful. Beside the rivers are roads and beside many of the roads are railroad tracks. And tucked away some where will be small village. A fabric store is sometimes a delight and at others times a temptation for me. I was walking through one the other day. I couldn’t get by this piece of material. It is a sturdy cream and charcoal check. And I tried a little embroidery on it. The sides of the white bordered squares are about one and one-half inches. This charcoal gray has a green cast to it. And the green thread brings that out, although it is not apparent to me in the photo. The red thread in the next photo makes the charcoal threads look much blacker. And this stitching is on the back of the fabric. I like the backside of the little border as much as the front. I wanted to mention some posts of special note by Bernadette over at Color, Line and Texture. She was involved in SharonB’s 2007 TAST challenge and has now had an opportunity to post about her work. It is a stunning piece. And I’m so glad it is available to others now. I was privileged to see most of this last year as Bernadette stitched through various portions of it. But it’s breath taking to see it as she’s now been able to document it. If you haven’t already visited her blog and seen it, please do pop over to see the posts. The first is here. And this and this post contain more details. While you’re there do see her other on going work. She’s been involved with SharonB’s TIF challenge for this year and recently posted about progress on her October quilt block. Many thanks, Bernadette for sharing a treasure with all of us. I’ve been working with round chicken scratch intermittently since my last post on the subject. Over the weekend I got some more beads for experiments. So I thought I’d show some of the work I’ve been doing. I’m turning the original piece into a pincushion. Nothing has fallen in to place for a good border. I’m still full of experiments but may settle for beading the center of each circle for a contrast. Here’s the current border that’s in the original piece at the moment. Because of the honeycombed arrangement the circles, the border will not configure the same way vertically as it does horizontally. I have two kinds of white beads. One is rounded with a hole through the center; the other is like a tiny length cut off a drinking straw. It’s no wild guess that I know little about beads. Here is a side by side comparison. I like the rounded look best for this. Saturday I received some of my old embroidery pieces back from a shop that had kept them in their cupboard. It was surprising to look at all that work and compare it to some of the things I’ve been doing recently. I’ve been having fun and struggles with the knotted diamond stitch. As the samples below indicate I haven’t hit my stride in controling the tension on the thread. Looking at the photos when was preparing the posts made me realized how much I need to practice situating the knots, too. Despite all that I’m excited about what this stitch can do. The texture is wonderful. And I want to try more couching experiments. In the photo above I switched to perle 8 and 5 cotton. It is has less play than the pima cotton and is easier for me to work with. However, the samples below are all pima cotton. This photo below shows a double diamond pattern. I like the broad line. I have so enjoyed the discussion on beauty. All of the comments are ending up in my journal with my own notes. And I want to read more on the subject to explore it further. If anyone has suggestions for good books or essays, I’m taking recommendations. Thanks very much. 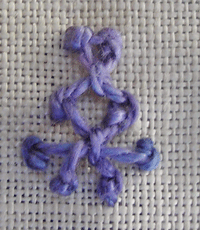 I’m on my way to learning more about knotted diamond stitches thanks to Julie, Carol-Anne and Mary Corbet. Samples are below. And I’m learning so much as I think about what people have been writing to me in response to the last post on the concept of beauty. Here is a link to view the comments. As I was listening to what was being said, I threw out some more questions in an emails to a couple of people. How much does our training and knowledge of a field or lack thereof color our ability to see the beauty of a piece? Is that factor part of what enters into our saying ‘beauty is in the eye of the beholder“? I think about other times in history when some cultures have had very distinct formulas for what is or is not beautiful. And it seems to me at times in some cultures it has been fashionable for the artist or maker to fly in the face of those formulas. How much is our concept of beauty influenced by our own times and the culture we live in? I loved the way Lynn’s comment already brings out some of those considerations due to her studies. If you have additional thoughts please do add them to the discussion via a comment. Now turning to the samples on the knotted diamond stitch, it looks like more practice ahead to get better control over the knots and tension. Trying out different widths above and below. Couching here and in the last photo. Trying out a number of threads. I’m in panic mode because four of my samples from this summer are missing. I had them Saturday. But today when I went to get them for photographing…no where. This is one sample from this weekend. I’ll be back with a post on the topic once I relocate those samples that go with this one. I’m having second thoughts on my “ugly” post from Friday. Maybe there are another few lessons from that piece that I need to learn. I received two comments about that piece and both touched on the appropriateness of that designation. Perhaps I could say “disappointing” instead of “ugly” that relates only to my feeling about what happened with the piece. We have a saying, beauty is in the eye of the beholder. Maybe ugly is, too. Usually I don’t even think of whatever I happen to be posting in terms of degrees of beauty or ugliness. I’m not even sure that when I’m stitching something that I even aim at making something beautiful. Do you have any thoughts about the part beauty plays in your stitching and once it’s finished do you come to a judgement about the level of beauty achieved? Please leave a comment, if you do. I would like to think more about this subject and other people’s input is always helpful. One of my other endeavors over the weekend was to learn the diamond stitch. I’d found it in a book and then went hunting on the net because I couldn’t make the knot on the left hand edge turn out well. And I couldn’t find an illustration of that portion of the stitch in step by step. If any one can clue me in about how to do this, I’d appreciate it. Thanks very much. I’ve been thinking about SharonB‘s October TIF challenge. She had two questions about our textile work space. The first, how do you feel about it? The second, what role does it play in your life? At the beginning of the month I couldn’t even capture a single idea about it. The first question seemed easier than the second. I have everything at my finger tips when I’m stitching. I have good light and a fairly comfortable seat for stitching. There are a couple of books within arms reach for easy reference. More are close by. Supplies are handy. Every day has it’s problems and duties and as I’m out and about I usually have something with me so I can sketch or stitch if I have a few down spots along the way. But when I get home and can actually sit down to stitch in my work spot, it feels like I’ve flown away to a little nest. It’s a safe spot and from there I can concentrate on the work at hand. I think I do my best work there. I find it much harder to make progress or experiment when I’m on the go or in another place. Other things are distracting me. And when there are no other distractions, my own thoughts tend to scatter more than when I’m in my normal place. I don’t have supplies readily available. Sometimes the lighting is a problem, too. As I began thinking along these lines, my sketches for the October FIT have been based on this photo I took sometime last year. I lost the original and had to try and reconstruct it so I suppose to some degree the sketches based on my imagination as my thoughts keep going back to original photo. I’ll probably post an update with those sketches when I think about Sharon’s second question more. I’m still working on September’s TIF. In the original photo the house was lined up so that it reminded me of a bird’s nest perched in the tree. I think my ugliest stitching to date is finished. I almost backed out of posting it. But I need it as a reminder of how much I can learn from a project that should have hit the scrap pile long before this point. I learned some lessons about color, about mixing stitches within a piece and some new thoughts occurred while I was using one of the raised chain stitches on the piece. When I decided that I couldn’t turn it around, I actually enjoyed doing what I could with it. I didn’t spend lot of time on it, but the time I did use allowed some lessons to sink in deeply. It allowed me to see some of my design teacher’s cautions to me worked out in a way that I now know with certainty why she wisely gave them to me. And that is a good understanding to gain. You are currently browsing the Quieter Moments blog archives for October, 2008.